The original Star Wars films were truly groundbreaking. Conceived by George Lucas as a set of 9 movies starting with episodes 4, 5 and 6, this was story-telling on a grand scale with scope for prequels and sequels. The associated merchandising created a whole industry of models, toys, games and other tie-ins. The films used a lot of technically challenging special effects, and of course John Williams' music was credited with a substantial revival of the large orchestral film score. The music plays throughout most of the film (since little dialogue is required during space battles!) and it is grand symphonic story-telling in its own right. The music is great fun for the family audience, with loads of exciting fanfares and marches. It also fills the gaps that the visuals can only hint at in terms of the underlying emotional aspects of the story, from the subtle relationships between the characters to the more obvious distinctions between the good guys and the bad guys. The music is rich in thematic motifs both long and short (full themes and simple figures) which are deployed throughout the films as a familiar frame of reference, joining scenes, segments and films into a single flowing tapestry. The soundtrack for the first film surprised everyone with sales figures for its initial release. 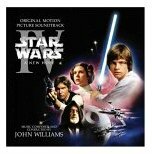 This and subsequent soundtracks introduced us to all the familiar music for the series - the Star Wars main theme, the Force theme and the Empire theme, with many of the main characters getting their own associated themes - Leia, Yoda, the Ewoks, and the Emperor. Some of the soundtrack consists of "source music" meaning that it is played by characters in the film rather than background music. It was probably a shock to most of us to learn that John Williams composed these pieces too and not the Ewoks or the alien creatures in the Cantina Band! Highlights from the first film alone include the tension building of the space battle before the final destruction of the Death Star, the delicate orchestration of Leia's theme, the Cantina Band's wacky jazzy ragtime mix, and the heroic final march in the Throne Room. 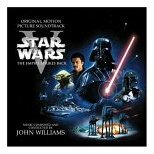 The first soundtrack also confidently puts in place certain non-thematic trade marks for the following films: no sooner does the 20th Century Fox fanfare finish than a full tutti chord by the London Symphony Orchestra heralds the main Star Wars fanfare and march. The music for the final scene always flows immediately into the End Titles which reiterate the Main Theme and conclude the film, as though a TV series were saying "to be continued...". 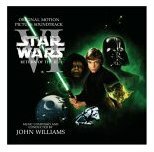 Pianists will also be interested to learn that there is a collection of all the best music from the 6 Star Wars films called Star Wars: A Musical Journey available from the MusicRoom and other online stores.